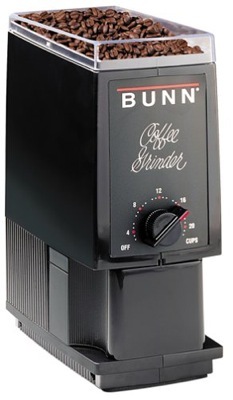 What Coffee Grinder are you using? 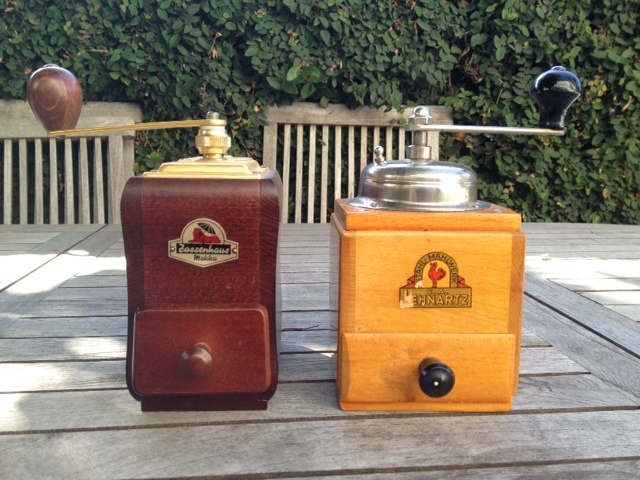 After seeing Barry's wonderful collection of coffee grinders, I thought I would see what everyone is using. 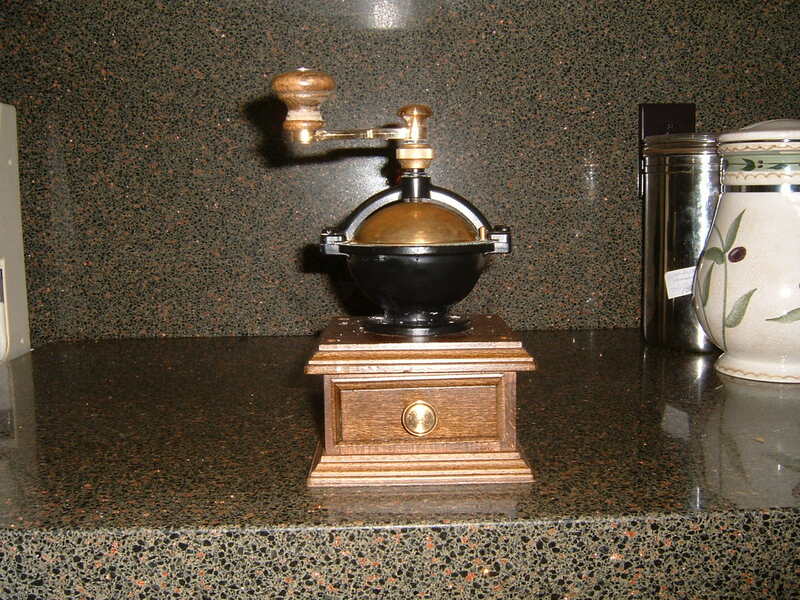 Please post a picture of your coffee grinder. I finally got to use it yesterday. All I had before this was a cheap electric grinder and I kept hearing about the Zassenhaus hand grinders. Well, I can now say I understand their popularity. 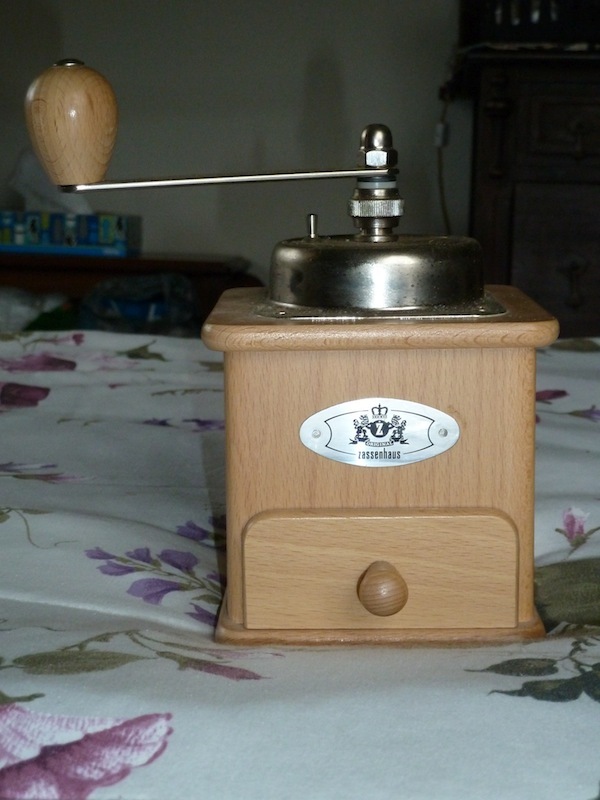 It was incredibly easy to use, grinds the beans evenly, and is a great looker, too. The coffee I ground was 100% Kona brought back from the Big Island of Hawaii. I used my new programmable ketttle and AeroPress and got one of the best cups of homemade coffee I have ever had. Usually, I cannot make a decent cup of coffee to save my life. However, these three products, especially the Zassenhaus because of the way it grinds beans, made it easy to consistently get a wonderful morning pick-me-up cup of coffee. Actually, more than one. That is a great looking grinder Freddy! Here are my two grinders. Phil, do you keep one of those beauties at work so you can grind beans there? Wow, great grinders, fellows! I almost wished I drank coffee! I do love the smell! (10-27-2013, 11:25 AM)freddy Wrote: Phil, do you keep one of those beauties at work so you can grind beans there? I am thinking about it. Right now, I have a Kuerig at work because it is easier. Washing a coffee maker (even an Aeropress) would be difficult as there is no kitchen and I would have to use the bathroom sink. Is this thread just for hand-cranked grinders?.... I don't have any of those, just a Braun electric. (10-27-2013, 12:36 PM)churchilllafemme Wrote: Is this thread just for hand-cranked grinders?.... I don't have any of those, just a Braun electric. Nope -all grinders are welcome. 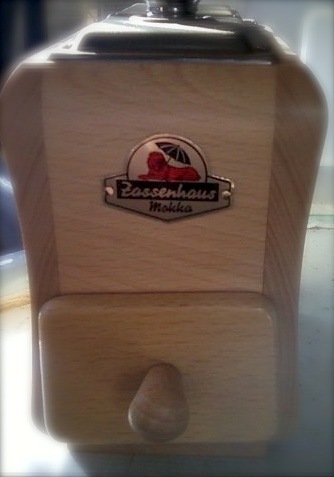 I have several electric grinders including my large industrial BUNN grinder, but I also have this Zassenhaus. Wow Barry! That is a stunner! Is that a high capacity Zass? Barry, that is gorgeous! I'm beginning to understand why you have a collection of grinders. (10-27-2013, 01:32 PM)bullgoose Wrote: Wow Barry! That is a stunner! Is that a high capacity Zass? No it is a regular contemporary grinder. Still available for purchase. It is sought after and often hard to find. It is The Cobra of Zasses. Are there any small electric burr grinders that are somewhat quiet...my blade grinder is loud enough to wake the dead!!!! Barry, thanks so much for all of your input here. Because of your posts and Johnny's wonderful gift I can appreciate just a wee bit more the coffee making process. Heaven help me if I ever decide to attempt to roast my own beans. Yikes...something else to put on my wishlist. It looks like the hopper holds more beans. Am I mistaking? Oh, jeepers, Phil, I won't tell you what I just did! With shaving goodies, fountain pen goodies, tea goodies, and (now) coffee goodies I am doomed! Yes that particular grinder offers three advantages. 1. It holds more than the average box grinder. 2. It has a closed hopper. As the coffee is ground unground or partially ground beans do not jump out of the hopper and go flying around the kitchen floor. 3. Finally the handle design offers more torque than other models . Making it easier to grind coffee. (10-27-2013, 02:42 PM)Harvey Wrote: Are there any small electric burr grinders that are somewhat quiet...my blade grinder is loud enough to wake the dead!!!! Blade grinders are a definate no- no. Using a blade grinder is similar to shaving with the top of a rusty tin can. 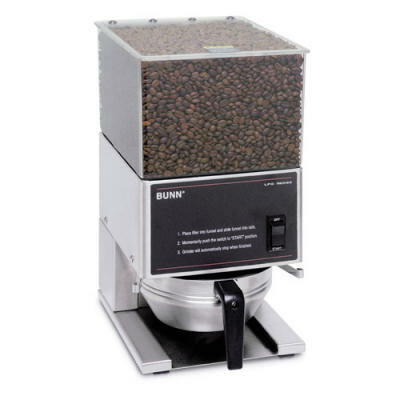 A blade grinder does not grind the beans. The blades shred the beans. The result of shreding the beans is particles of different sizes and a bunch of coffee dust. The small particles and dust will result in the brew being bitter. While the large particles will result in a weak brew. The advantage of a burr grinder is a uniform brew. I recently bought my daughter a Bodum burr grinder. It was 109 at the time I bought it. I think they are about 119 now. They have a small foot print on the kitchen counter and make for a nice brew. 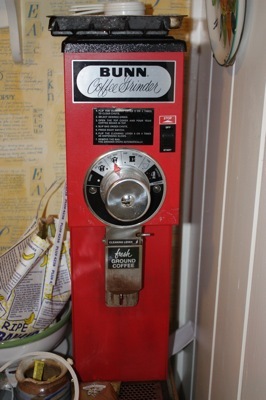 Bunn made one for home use but I'm not sure it is still being made. I have one and it works great. A G1Hd and the LPG large hopper grinder. Yes, Johnny, but can you shave with it?